Around 1930 Heinz Kilfitt ( photo on the right), a trained watchmaker, designed a new 35 mm film compact camera using a 24x24mm frame format. The 24x24mm square frame provided many advantages including allowing for over 50 exposures per standard roll of Leica film instead of 36. Kodak and Agfa rejected the design and it was sold to Hans Berning who set up the Otto Berning firm. 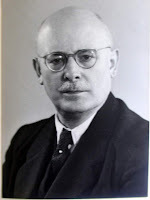 Hans Heinrich Berning, with a little help from his father, founded Otto Berning & Co. in Schwelm (Westphalia), with production in Duesseldorf from about 1934. Otto Berning ( photo on the right)got its first Robot patent in 1934. This omitted the spring motor drive as it was originally intended to come in two versions: Robot I, without motor, and Robot II with a spring motor. Its release was delayed and already the first camera "Robot I" included its hallmark spring motor. The first production cam eras had a spring drive that could turn at a sensational 4 frame/s. The body of the Robot 1 is Stainless steel. Kilfitt designed a rotary shutter with speeds from 1 to 1/500th second. The camera used proprietary "Type K" cartridges, not the standard 35 mm cartridges introduced in the same year by Kodak's Dr. August Ángel Kamerawerk for the Retina available today. The camera has no rangefinder. Its does not need one: it was designed for use mostly with short focal length lenses. The stainless steel body was made by WMF in Geislingen a.d. Steigen; the spring film wind by clock manufacturers Bauerle from the Schwarzwald; the shutter by Gauthier of Calmbach; and lenses came mostly from Schneider and Zeiss. Two particularly unusual features of the original Robot I, of which about 30,000 were made up to 1938, were the swivelling viewfinder, which could be turned to allow shooting at right angles to the line of sight, and a built-in yellow/green filter that could be switched in and out. The Robot I was quite small, the body measuring only 4.25 inches long, 2.5 inches high, and 1.25 inches deep. A razor sharp, zone focusing f2.8, 3.25 cm Zeiss Tessar lens added only 1/2 inch to the camera depth. It was about the size of an Olympus Stylus although it weighed about 20 ounces, approximately the weight of a modern SLR. The die cast zinc and stamped stainless steel body was crammed with clockwork. A spring motor on the top plate provided the driving force for a rotary behind the lens shutter and a sprocket film drive. The film was loaded into cassettes in a darkroom or changing bag. The cassettes appear to be based on the Agfa Memo cassette design, the now-standard Kodak 35 mm cassette not yet being popular in Germany. In place of the velvet light trap on modern cassettes, the Robot cassette used spring pressure and felt pads to close the film passage. When the camera back was shut, the compression opened the passage and the film could travel freely from one cassette to another. The rotary shutter and the film drive are like those used in cine cameras. When the photographer's finger pressed the shutter release, a light blocking shield lifted and the shutter disc rotated a full turn exposing the film through its open sector. When the finger was raised, the light blocking shield returned to its position behind the lens, the spring motor advanced the film and recocked the shutter. The action was almost instantaneous. With practice a photographer could take 4 or 5 pictures a second. Each winding of the spring motor was good for about 25 pictures or half a roll of film. Shutter speed was determined by spring tension and mechanical delay since the exposure sector was fixed. The Robot I had an exposure range of 1 to 1/500 s plus the usual provision for time exposures. The camera had other features not specifically related to action photography. The small optical viewfinder could be rotated 90 degrees to permit pictures to be taken in one direction while the photographer was facing in another. When the viewfinder was rotated, the scene was viewed through a deep purple filter similar to those used by cinematographers to judge the black and white contrast of an image. The camera had a built in deep yellow filter which could be positioned behind the lens.